1 A None No Power Seat 1 A has slightly extra legroom due to the position of the bulkhead. Proximity to the galley may be bothersome. Passengers with infants are often placed in this row as it is equipped with a bassinet. 1 B None No Power Seat 1 B has slightly extra legroom due to the position of the bulkhead. Proximity to the galley may be bothersome. Passengers with infants are often placed in this row as it is equipped with a bassinet. 1 D None No Power Seat 1 D has slightly restricted legroom due to the position of the bulkhead. Proximity to the galley may be bothersome. Passengers with infants are often placed in this row as it is equipped with a bassinet. 1 G None No Power Seat 1 G has slightly restricted legroom due to the position of the bulkhead. Proximity to the lavatory and galley may be bothersome. Passengers with infants are often placed in this row as it is equipped with a bassinet. 1 J None No Power Seat 1 J has slightly extra legroom due to the position of the bulkhead. Proximity to the lavatory and galley may be bothersome. Passengers with infants are often placed in this row as it is equipped with a bassinet. 1 K None No Power Seat 1 K has slightly extra legroom due to the position of the bulkhead. Proximity to the lavatory and galley may be bothersome. Passengers with infants are often placed in this row as it is equipped with a bassinet. 10 J None No Power Seat 10 J is a standard Economy seat. 10 K None No Power Seat 10 K is a standard Economy seat. 25 A None No Power Seat 25 A has limited recline and proximity to the lavatory may be bothersome. 25 B None No Power Seat 25 B has limited recline and proximity to the lavatory may be bothersome. 26 D None No Power Seat 26 D has limited recline and proximity to the lavatory may be bothersome. 26 E None No Power Seat 26 E has limited recline and proximity to the lavatory may be bothersome. 26 F None No Power Seat 26 F has limited recline and proximity to the lavatory may be bothersome. 26 G None No Power Seat 26 G has limited recline and proximity to the lavatory may be bothersome. 26 J None No Power Seat 26 J has limited recline and proximity to the lavatory may be bothersome. 26 K None No Power Seat 26 K has limited recline and proximity to the lavatory may be bothersome. 27 A None No Power Seat 27 A has extra legroom due to the exit row. There is no floor storage during takeoff and landing. The tray table is in the armrest, slightly reducing seat width. 27 B None No Power Seat 27 B has extra legroom due to the exit row. There is no floor storage during takeoff and landing. The tray table is in the armrest, slightly reducing seat width. 27 D None No Power Seat 27 D has extra legroom due to the position of the bulkhead, however proximity to the lavatory may be bothersome. Passengers with infants are often seated in this row. 27 E None No Power Seat 27 E has extra legroom due to the position of the bulkhead, however proximity to the lavatory may be bothersome. Passengers with infants are often seated in this row. 27 F None No Power Seat 27 F has extra legroom due to the position of the bulkhead, however proximity to the lavatory may be bothersome. Passengers with infants are often seated in this row. 27 G None No Power Seat 27 G has extra legroom due to the position of the bulkhead, however proximity to the lavatory may be bothersome. Passengers with infants are often seated in this row. 27 J None No Power Seat 27 J has extra legroom due to the exit row. There is no floor storage during takeoff and landing. The tray table is in the armrest, slightly reducing seat width. 27 K None No Power Seat 27 K has extra legroom due to the exit row. There is no floor storage during takeoff and landing. The tray table is in the armrest, slightly reducing seat width. 39 D None No Power Seat 39 D juts into the aisle and is often bumped by service carts and passengers during flight. 39 G None No Power Seat 39 G juts into the aisle and is often bumped by service carts and passengers during flight. 40 D None No Power Seat 40 D is misaligned with the row ahead so legroom is often restricted. 40 E None No Power Seat 40 E is misaligned with the row ahead so legroom is often restricted. 40 G None No Power Seat 40 G is misaligned with the row ahead so legroom is often restricted. 41 A None No Power Seat 41 A does not recline and proximity to the lavatory may be bothersome. 41 B None No Power Seat 41 B does not recline and proximity to the lavatory may be bothersome. 42 D None No Power Seat 42 D is a standard Economy seat. 42 E None No Power Seat 42 E is a standard Economy seat. 42 G None No Power Seat 42 G is a standard Economy seat. 43 D None No Power Seat 43 D is a standard Economy seat, however proximity to the lavatory may be bothersome. 43 E None No Power Seat 43 E is a standard Economy seat. 43 G None No Power Seat 43 G is a standard Economy seat. 43 J None No Power Seat 43 J is in the last of Economy and does not recline. Proximity to the lavatory and galley may be bothersome. 43 K None No Power Seat 43 K is in the last of Economy and does not recline. Proximity to the lavatory and galley may be bothersome. 44 D None No Power Seat 44 D is in the last of Economy and does not recline. Proximity to the lavatory and galley may be bothersome. 44 E None No Power Seat 44 E is in the last of Economy and does not recline. Proximity to the lavatory and galley may be bothersome. 44 G None No Power Seat 44 G is in the last of Economy and does not recline. Proximity to the lavatory and galley may be bothersome. 5 A None No Power Seat 5 A may have limited recline and close proximity to the galley may be bothersome. 5 B None No Power Seat 5 B may have limited recline and close proximity to the galley may be bothersome. 5 D None No Power Seat 5 D may have limited recline and close proximity to the galley may be bothersome. 5 G None No Power Seat 5 G may have limited recline and close proximity to the galley and lavatory may be bothersome. 5 J None No Power Seat 5 J may have limited recline and close proximity to the galley and lavatory may be bothersome. 5 K None No Power Seat 5 K may have limited recline and close proximity to the galley and lavatory may be bothersome. 7 A None No Power Seat 7 A has extra legroom due to the exit row, although proximity to the galley may be bothersome. There is no floor storage during takeoff and landing. The tray table is located in the armrest, slightly reducing seat width. 7 B None No Power Seat 7 B has extra legroom due to the exit row, although proximity to the galley may be bothersome. There is no floor storage during takeoff and landing. The tray table is located in the armrest, slightly reducing seat width. 7 J None No Power Seat 7 J has extra legroom due to the exit row, although proximity to the galley may be bothersome. There is no floor storage during takeoff and landing. The tray table is located in the armrest, slightly reducing seat width. 7 K None No Power Seat 7 K has extra legroom due to the exit row, although proximity to the galley may be bothersome. There is no floor storage during takeoff and landing. The tray table is located in the armrest, slightly reducing seat width. 8 D None No Power Seat 8 D has extra legroom due to the position of the bulkhead, however proximity to the galley may be bothersome. Passengers with infants are often seated in this row. 8 E None No Power Seat 8 E has extra legroom due to the position of the bulkhead, however proximity to the galley may be bothersome. Passengers with infants are often seated in this row. 8 F None No Power Seat 8 F has extra legroom due to the position of the bulkhead, however proximity to the galley may be bothersome. Passengers with infants are often seated in this row. 8 G None No Power Seat 8 G has extra legroom due to the position of the bulkhead, however proximity to the galley may be bothersome. Passengers with infants are often seated in this row. 8 J None No Power Seat 8 J is a standard Economy seat. 8 K None No Power Seat 8 K is a standard Economy seat. 9 G None No Power Seat 9 G is a standard Economy seat. 9 J None No Power Seat 9 J is a standard Economy seat. 9 K None No Power Seat 9 K is a standard Economy seat. 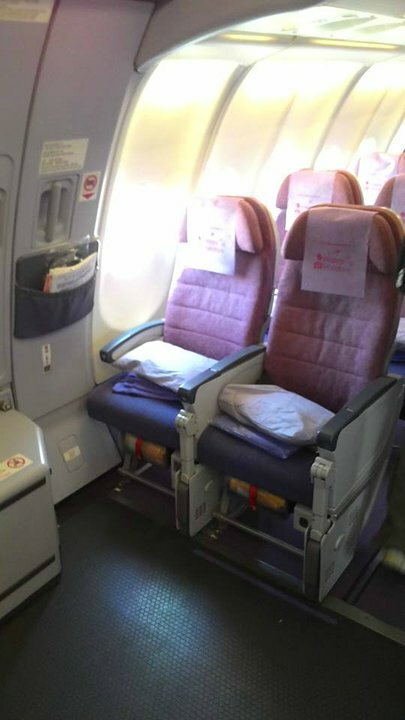 The in-flight entertainment on this aircraft, AVOD (Audio Video on Demand) features 12 audio channels ranging from Chinese hits to songs from the box office. All passengers have a personal AVOD in-flight entertainment system. Business class has a personal 10.4" screen, and Economy class has a personal 6.5" screen. Different movie options are available for viewing. Only on flights to Germany, France and Italy, the movies will be dubbed in German, French and Italian. Each Business Class seat has individual 110V laptop power outlets and in-seat satellite telephone. In Economy, there is one 110V laptop power outlet for every two seats. Food service is available on medium- to long-haul flights. China Airlines has three versions of their A330-300 aircraft. This version is a long-haul configuration with two classes: Business and Economy. This aircraft is handicap accessible with redesigned, larger lavatories. In flight services are free- drinks, snacks and meals. Business class seats feature a reclining angle of 170 degrees. All seats are equipped with personal AVOD in-flight entertainment systems which offer an array of entertainment selections. In Business Class, multiple-system power connections are also available right at your fingertips. One small advantage of the middle seats on this plane is that they're actually pairs of two seats, so if you're faster than your neighbour, you can flip up your arm rest and gain an extra 3-4cm of space. The downside is that there's a big electronics box under the seat which takes up about 1/3 of the leg room. This plane also has ancient screens which really terrible picture quality, so bring your own tablet/notebook if you want to actually watch something without going blind. I would change this to a red seat. Why? Because the raft is inside the door and sticks out so far that it takes up 2/3 of the leg room for this seat. In other words, if you have legs, this is a bad seat. You're not allowed to rest your legs on top of raft compartment, as it apparently contains very sensitive equipment... The seat is also significantly narrower than other seats on this plane due to both the tray and TV being in the arm rest. The seat is quite small for an 8 hour flight from Brisbane to Taipei, the screen is super small, and I even couldn't hear clearly from the headphone provided. What surprised me the most is that it did not even have a place to charge your phone - I asked two flight attendants and what I heard is that the only place to charge is under 7A/B which conflicts the info here. Don't take it unless you're looking to suffer. The economy seats have Very little space from the seat in front and back. My knees touch the back of the seat in front. I. Am only 6ft tall. This for a 9 hr flight is unacceptable!! Take another airlines! Bulkhead buz-class seat. Spacious overkill for the short TPE-KIX rt. Crew attentive, service excellent. A great product for the cost. China Airlines flies 2 versions of Airbus A330-300.